Mr Sunshine was held in Klang Parade Shopping Complex and WHBC was the the sponsors. The other sponsors were Milano and Klang Parade. I was also a judge for this event. It was a talent contest where each participant performs his/her best talent on stage. Some sang, some danced, one did a magic show, etc, etc. Two of WHBC's members , James Phua came in third with his amzing karate kick and chops! and Pooba grabbed 4th with his Bollywood dance. 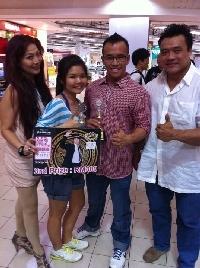 The winner was a Malay contestant who sang his heart out to vow the judges and audiences. He has an amazing voice!